1. Oil spikes again: US crude futures hit their highest levels since late 2014 on Friday, trading at $71.60 per barrel. Prices of Brent crude, the international benchmark, topped $80 per barrel Thursday. Oil prices have risen significantly in recent weeks, mostly because of concerns about Iranian supplies after President Donald Trump ditched the nuclear deal, and a collapse in Venezuelan production. The rise is starting to trouble big energy consuming nations. India's energy minister said he called his Saudi Arabian counterpart late on Thursday to express his concern. 2. PayPal's biggest takeover: PayPal announced Thursday that it is buying iZettle for $2.2 billion. It's the online payments firm's biggest ever acquisition and gives the company a bigger footprint in physical stores. A Swedish startup, iZettle provides small businesses with card readers that can be connected to smart phones and tablets. It also offers platforms for sales and inventory tracking. 3. China-US trade talks: US officials said Thursday that China had proposed boosting its imports of American goods by around $200 billion in an attempt to reduce the massive trade imbalance between the two countries. China bought $130 billion of American goods last year, according to US government figures. However, Chinese Foreign Ministry spokesman Lu Kang denied on Friday that such an offer had been made. "These rumors are not true," he said. The world's two biggest economies have been locked in a trade dispute for months. A top level Chinese delegation is in Washington for trade talks this week. Thursday's meetings included one in the Oval Office between Trump and Chinese Vice Premier Liu He, the top economic adviser to Chinese President Xi Jinping. The talks are set to continue on Friday. Lu described them as "constructive." 4. 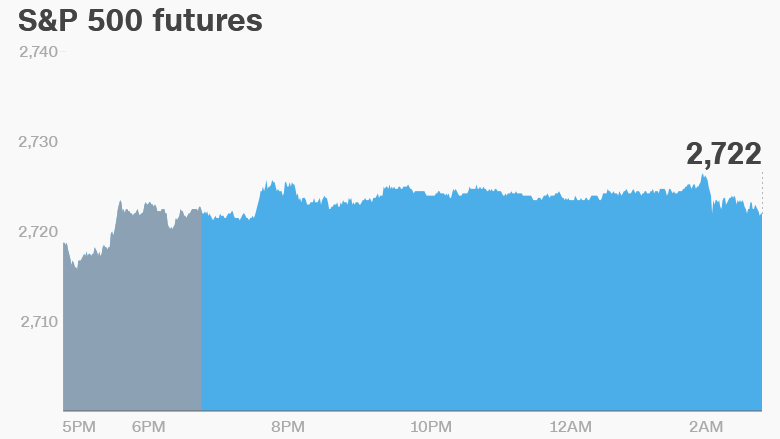 Global market overview: US stock futures were trading higher early on Friday. European markets opened mostly lower, while stocks in Asia ended the session mixed. The Dow Jones industrial average and the Nasdaq both shed 0.2% on Thursday. The S&P 500 closed 0.1% lower. 5. Earnings and economics: Campbell Soup (CPB) and Deere (DE) are set to release earnings before the open Friday. Canadian inflation statistics for April will be released at 8:30 a.m. ET.